Feeling overwhelmed with news and information? If so, you aren’t alone. A Pew Research Center survey found that 70 percent of respondents felt overwhelmed by the amount of news and information from different sources; 72 percent believed that news organizations tend to favor one side; and 80 percent said that news organizations are often influenced by powerful people and organizations. 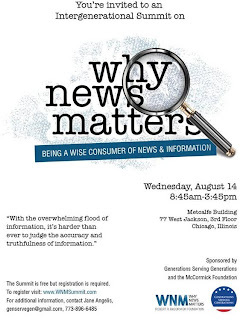 The McCormick Foundation’s answer to this dilemma is a new project called Why News Matters. You’re invited to this Intergenerational Summit that will provide ideas on being a wise consumer of news and information. Members of four generations will put their heads together to highlight some easy-to-use skills that help individuals determine “fact from fiction,” in the news and information that comes from print, technology, and in everyday life. The Summit will be held in Chicago at the Metcalfe Building, 77 West Jackson, 3rd. Floor from 8:45 to 3:45. The event is free but registration is required. Registration: www.WNMsummit.com is open until August 8 or until the limit for each generation is reached. "With the overwhelming flood of information, it’s harder than ever for consumers to distinguish news from noise. A Pew Research Center survey found that 70 percent of respondents feel overwhelmed by the amount of news and information from different sources, and 72 percent think most sources of news are biased. A healthy 21st Century democracy relies on informed citizens with the ability to access and analyze information. For example, research from Stony Brook University suggests that students who have taken a news literacy course are more likely to register to vote, volunteer and consciously increase their exposure to news than students who have not taken the course. 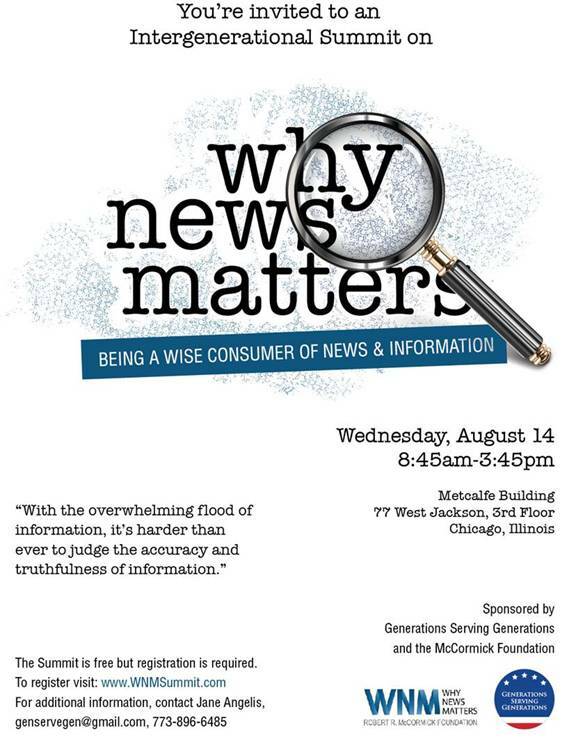 The Foundation wants to help Chicagoans understand Why News Matters. Media organizations, high schools, universities, two-year colleges, community organizations, libraries and others all have a role to play." The Summit is intended to bring together educators and leaders of non-school youth-serving organizations to share ideas and look at strategies for engaging youth and adults in an on-going effort to understand Why News Matters. Break out Sessions will share ideas for "Judging News and Information for Accuracy" and will encourage Organizations and Individual participants to Join in Creating and Awareness of Why News Matters. Generations Serving Generations was established as the Illinois Policy Academy on the Civic Engagement of Older Adults in 2008 through the National Governors Association Center for Bet Practices. Illinois was one of 14 states selected to participate in the project designed to improve the health and lives of older Americans and increase their civic engagement through service, learning, and work. Generations Serving Generations is a public/private partnership led by Director John Holton, Illinois Department on Aging, Peggy Luce, Vice President of the Chicagoland Chamber, and Brandon Bodor, Executive Director, Serve Illinois Commission, Office of Governor Pat Quinn. 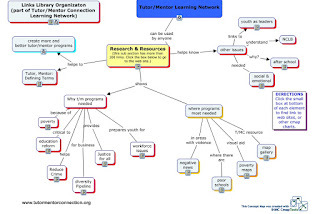 When I launched the Tutor/Mentor Connection (T/MC) in 1993 my goal was to collect and share information that people could use to make volunteer-based tutor/mentor programs available in more high poverty neighborhoods, and to help those programs constantly improve what they we able to do to connect youth and volunteers and help youth through school and into adult lives. I stated hosting this library on the Internet in 1998 and now it includes more than 2000 links. At least once each year I try to go through each section to make sure the links are working and to refresh my own understanding of what's in the library. The graphic below shows the sub sections in the research portion of the library which I've reviewed over the past two days. You can open this map here. This set of links is divided into two parts. a) what are the reasons tutor/mentor programs are needed, and b) where are they most needed, based on poverty, public health information, violence, crime, etc. There are more than 250 links in this section of the library and most of the sites I point to contain numerous articles and links to even more web sites. While I record over 60,000 page views a month in this single web site, most people don't even know this resource exists. While my goal is that thousands of people might spend one or two hours every week, over five or ten years, looking at this information and discussing it with others who want to help at-risk youth in their communities, I don't have the resources to make that happen. Yet, by making this information available, I make it possible. I've written numerous articles about learning and about MOOCs in the past which express my belief that content libraries like mine could be incorporated in organized on-line events, similar to the Making Learning Connected MOOC that is live right now and the Education, Technology and Media MOOC that took place in Jan-March 2013. Both of these events lasted for several weeks and provided structure which was communicated on blogs, email newsletters and in the Google+ Community page. They offered opportunities for participants to interact in a variety of platforms, as much, or as little as time permitted. I see relationships growing as a result. So far the MOOCs I've been part of were focused on generic topics, not on specific social or environmental issues. Instead of basing the MOOC on a pre-existing content library, the members create and submit content as as do people who lead each week's discussions. I suspect that in the future a growing number of MOOCs will focus on specific problems and that they will be intended to support a growing community of people who have a passion for the specific problem. As MOOCs repeat from year to year the content created in past years will be part of libraries that people can draw from in future years. Many will learn to include content libraries like mine as part of the resources provided to members of the community. MOOCs like this could be hosted and facilitated by universities, businesses, public policy institutes, foundations, and/or by intermediaries like myself. They need resources to host and facilitate large groups of people. They need to maintain a content library, which could be links to multiple content libraries such as I host in my library. They need a long-term commitment so that the MOOCS are repeated each year for many years. I've hosted the Tutor/Mentor Leadership and Networking Conference every six months for 20 years. I'll be hosting the next on November 4 and I created a page where people who have benefited from the conferences or from tutoring and mentoring programs can become a sponsor and post a message showing how they've been part of a tutor/mentor program. In order to build the large community of people needed to dramatically change the systems of support for inner city kids, or to solve some of the other environmental, social and political problems we face in this world, organizers of the type of MOOC I envision need to have this same long-term commitment, and the resources to not only host MOOCs, but to document the growth of participants in a wide variety of ways. At the same time content libraries need to be maintained so that each participant has access to a wider range of ideas than they might glean from their own experiences or from simply interacting with others in the MOOC. With such a resource, people can dig into this material at any time during the year. I've created dozens of graphics to stimulate thinking on this issue. 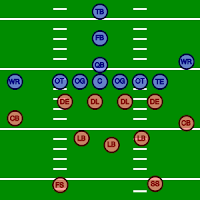 The one below is an example. These on Pinterest show more. I'd like to be part of the thinking and planning of anyone who is trying to support this type of learning. I'd also like to find co-owners for my own content library and web resources so they continue to be available in future years beyond my own lifetime. I'm already reaching out to others through groups on Facebook, Linked in, Twitter and existing MOOCs. If you're interested in this please contact me or take a role in the next Chicago conference so we can connect place based and web based learning efforts. In today's Chicago Tribune sports section David Haugh writes about Chicago Bulls star Derrick Rose speaking about violence in Chicago. Rose is quote as saying "It all starts with poverty." In the column Haugh writes "As powerful as Rose's words can be, his actions can change -- and perhaps save -- lives more profoundly." I agree. For many years I've tried to recruit celebrities and high profile sports stars to take on-going roles that would draw more volunteers and donors to the information on the Tutor/Mentor Connection and Tutor/Mentor Institute, LLC web site, and to volunteer-based tutor/mentor programs in all high poverty areas of Chicago and other cities. I created this animation last February, to demonstrate a simple role athletes and coaches can take on an on-going basis. This is a crude video because I don't have money to hire professionals to do this. Derrick Rose and his corporate sponsors have millions of dollars that could be used to produce videos like this, with Rose and other athletes as featured speakers. This is not asking athletes to spend time at charity events, be mentors, serve on boards or give money. It is asking athletes to use their time in front of microphones and cameras to not only talk about violence, but to point to places where people can get more informed and get involved. If athletes with access to high quality creative and video production talent could remake this video with themselves as the featured characters they could put it on their own web sites and point to it when a sports reporter asks a tough question that they may not want to answer. They can point to it everytime violence has a personal impact on them, their family and/or the neighborhood where they grew up. 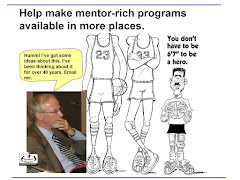 As more athletes and celebrities point to the Tutor/Mentor Program Locator and Chicago Program Links Library more people will be motivated to seek out one or more tutor/mentor programs where they can get involved. 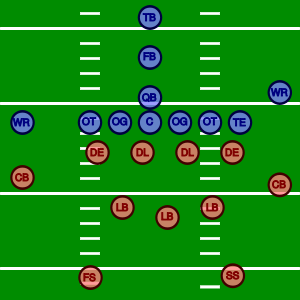 Some athletes may choose to go further with this, and begin coaching others to understand how teams of volunteers, donors, leaders, parents and community members need to be working together on an on-going basis to help mentor-rich programs be available in a neighborhood and to keep them available and constantly improving for a generation or longer. On this page you can see visualizations created by interns working with me for short periods of time. Imagine if rappers, pro athletes, advertising professionals and/or youth in high schools throughout the country were using their own talent, time and resources to create and share presentations like this. It can happen. Basketball is a sport where just one special athlete, like Derrick Rose, can change a poor team into a winner. All it takes is for one or two high profile athletes to create their own versions of this animation, for others to see roles they could take and to be motivated to do so. I've written more than 1000 articles since 2005, and many from previous years are just as relevant now as they were when I wrote them. In the research section of the Tutor/Mentor Connection library I point to more than 200 web sites with articles and research on poverty, drop out prevention, social capital, etc. Some were written 20 years ago, yet they also still are valuable resources....but only if people find them and read them. Thus, I'm pleased to show this presentation which was created by one of the interns from South Korea who was with me from last May through July 3 of this year. This shows work done by other interns in past years. It's one of two presentations like this which were done in the past few weeks. See the second here. I keep finding new ways to share information from my library. I've been part of a Making Learning Connected MOOC (#CLMOOC) for the past few weeks and one idea shared with me was a tool called "Jog the Web" that enables you to create a list of recommended web sites. I created this Research on Education, Poverty & Social Capital jog in about 30 minutes by scrolling through one section of my links library and picking a few links for the Jog. 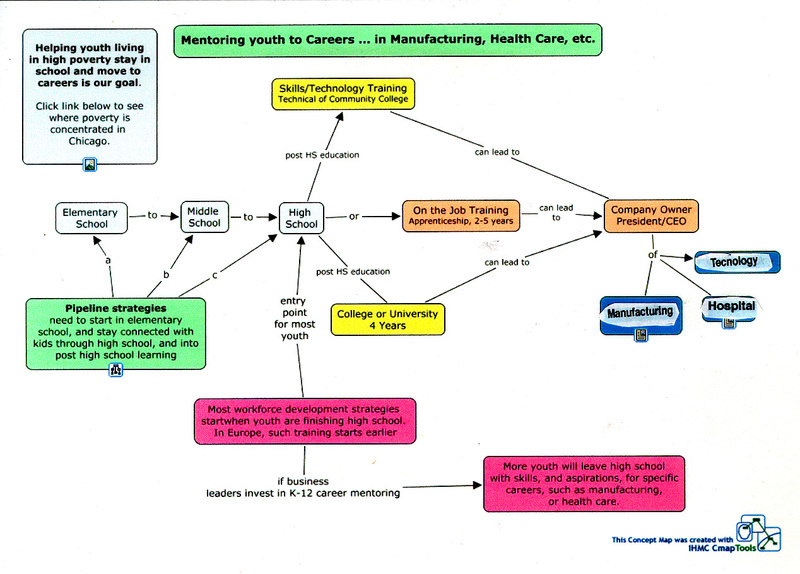 I think young people could be going through web libraries like mine, and using Google searches, to find information that they and adults in their communities might use to build more effective strategies for helping kids move safely through k-12 school and then into college, vocational school, the military, and into jobs and careers. For instance, school starts in another six weeks. 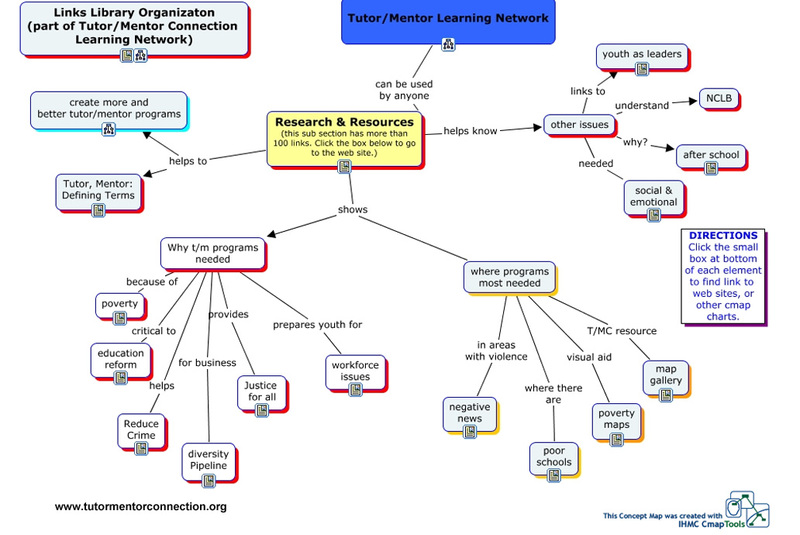 Teens could be building lists of links pointing to tutor/mentor programs in their neighborhood, or to the type of tutor/mentor programs they would like to see in their neighborhood just by browsing through this, this and this sections of my links library. They could be pointing to reasons and ways adults could support the growth of such programs by creating a list based on past articles on this web site, or by browsing the blog lists on the Tutor/Mentor Institute Library. They could be creating a variety of presentations, like the videos shown here, to encourage adults to volunteer time, talent and/or dollars to help build a k-12 network of youth serving programs in the neighborhood where they live or in neighborhoods where they are most needed. All it takes is a few pioneers to start doing this and others will follow. Today's Philanthropy Club of Chicago meeting featured Kate Cangemi, Program Officer, Community Health Initiatives, BlueCross BlueShield of Illinois. Yesterday I wrote about the Making Learning Connected MOOC #CLMOOC that started a couple of weeks ago. As I listened to Katie speak about the new Health Care Law (find info at BeCoveredIllinois.org) and about how Blue Cross Blue Shield of Illinois reviews more than 250 grant applications each cycle I made a list of topics that I felt could be discussion points in MOOCs connecting the non profit sector, the philanthropy sector, community members and policy makers. Here's my list. Non-profits connecting and discussing ways they are sharing information about the new Health Care Law with clients and with staff. I'd like to see this as a workshop at the November 4 Tutor/Mentor Conference in Chicago. However, it could also be a topic in a MOOC sponsored by BSBC or any other company or foundation. How are technology centers helping clients, staff understand and navigate the new Health Care Law. Chicago has a variety of community technology centers. Many youth serving programs have tech centers. An on-line discussion could share ideas for how different centers are using their technology to educate clients and staff on the new law. Staff turnover - how does this affect the knowledge base and organizational effectiveness of non profit organizations? What organizations have high turnover rates. How do funder decisions contribute to this? What can we do collectively to overcome this that we can't do working alone? Changes in Grant Making - Impact on NPOs. How do small non profits show impact? People are not widgets? Change takes place over many years. Impact in the neighborhood or family can negate even the best efforts of NPOs? Donor focus on specific neighborhoods. What if you're not in that neighborhood? What resources are available to help non profits identify donors who want to support work in the neighborhood where they operate? How might non profits in the same zip code or community area work together to enlist more corporate and foundation support of programs in their area? Grant Proposal is the "Golden Ticket". We don't have time to look at web sites? How can we educate donors to make giving decisions based on what we show on our web site and how they understand our work? Can we? Is it possible to generate on-going funding based on a review of information on a web site vs what gets presented in a narrowly constructed grant proposal? Do we reward great grant writers or great programs? Let's talk about collective impact. How do we make sure everyone in the neighborhood has 100% of needed operating funds so they can do their part of a collective effort? Let's talk about overhead and what it takes to build and sustain great organizations. How do we make sure we have great organizations in every neighborhood, instead of a few great organizations in a few neighborhoods? How do overworked managers, staff, foundation leaders, etc. find time to read this and participate in MOOCs and on-line networking and learning forums? Is it possible? What are the trade-offs? If you attended today's meeting, or have attended similar meetings where you've wanted to have a deeper conversation with donors and peers, but can't find ways to do this in face-to-face meetings, please add to this list and look for people willing to host and facilitate MOOCs where this is the focus. MOOCs "Not a Course. It's a Collaboration"
Terry Elliot, one of the participants in the Making Learning Connected MOOC #CLMOOC that started a couple of weeks ago posted an article today showing some of the people he's connected with, including me. In the article he included a line saying "This is not a course, it is a collaboration." I've written articles about MOOCs and their potential for supporting the on-going learning of groups of people trying to solve complex problems, like inner city poverty and related issues. I've also been aggregating a library of blog articles about MOOCs. I'd like to expand on Terry's thinking with a goal that others will join me in building a network of people who focus on volunteer-based tutor/mentor programs for the way they expand the social networks and learning opportunities for youth living in highly segregated neighborhoods of inner city poverty. First, let's learn to use maps to support collective action. Maps focus our attention on all of the high poverty areas in a geographic region. Using the Interactive Tutor/Mentor Program Locator you can also zoom into specific neighborhoods and add layers of information showing assets (faith groups, business, hospitals, universities) and transportation routes through the neighborhood. These maps can show all the people who might be connected in the type of MOOC Terry describes, who share a self interest and concern for reducing the negative impacts of poverty within the geography they share. 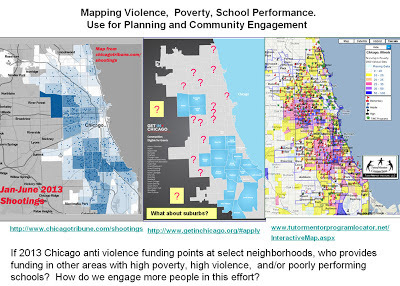 We ought to be able to build maps like the one being built for the #CLMOOC that show all the participants in an effort intended to reduce poverty, improve schools, stop violence, etc. 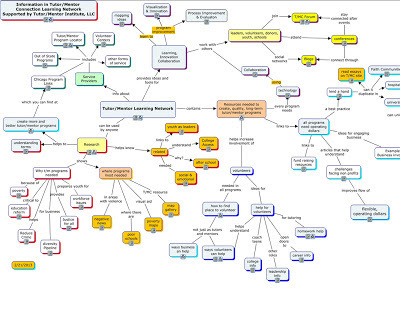 Second, let's use maps to show the talent and networks we need to bring in to a community of practice MOOC. 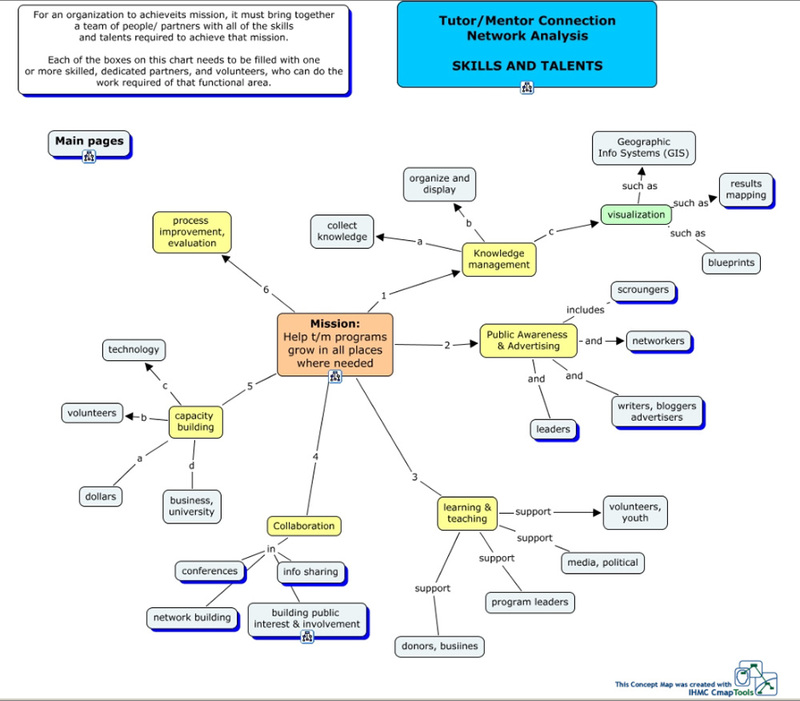 This is a 'talent map' showing skills needed for an organization, or a network, to achieve its mission. This is a 'network map' that illustrates the need to have representation from many sectors. 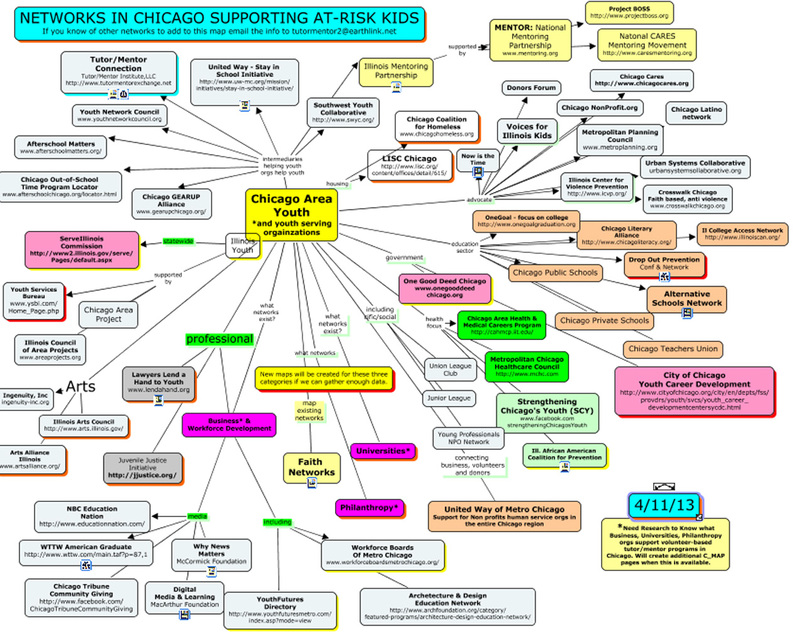 This is another map, showing youth intermediaries in Chicago. Traditional problem solving and community organizing has relied on face to face and small group meetings. In a big city like Chicago I don't feel you can ever connect with enough of the people needed to be involved on a one-on-one basis and you can't keep key people involved in place-based meetings for the years it will take to build and implement strategies that reduce poverty's impact in every high poverty neighborhood of the Chicago region. You can do more of this using the Internet and MOOCs that focus on "learning and collaboration". The "Who all needs to be included?" question should be answered by an on-going effort to build a library of links to information that already exists to research, funding, existing organizations, ideas, etc. This maps shows the library I've been building on line since 1998. Click into the links of this graphic and you'll go to sections of the library with a variety of links on each topic. Almost every web site I point to has a staff directory, a "contact us" button and many have Twitter and Facebook links. I'm constantly reaching out to these groups to connect them to me and the conference I host in Chicago every six months. 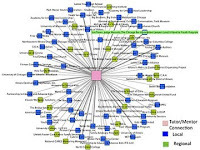 However, I feel on-line communities, organized like the ETMOOC and CLMOOC have the greatest potential for connecting people from a wide range of these organizations with each other. 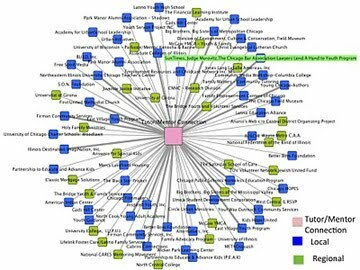 Participation mapping, like this, using social network analysis tools or GIS maps can also show who is taking part in these MOOCs. Giving recognition to those who are involved might encourage those who are not involved to join in. We're in July, starting the 2nd half of 2013. I hope that if you've read this you'll share it with people in universities, philanthropy, media, business and government who might be willing to sponsor this type of community building, not just on a one-time basis, but as part of on-going problem solving. By November 4, as I host a one day Tutor/Mentor Leadership and Networking Conference in Chicago a new MOOC focused on poverty, violence, education and workforce development in Chicago and other big cities could be in place. The result of our efforts can be more places where youth and volunteers are building long-term connections that benefit both the young people and the volunteers who are involved. Connect with me on Twitter, Facebook, or Linked in, the Tutor/Mentor Connection on Ning, or in one of the Google+ hangouts for these MOOCs. 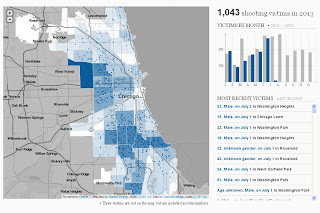 Mapping Chicago Violence. Engaging Community. 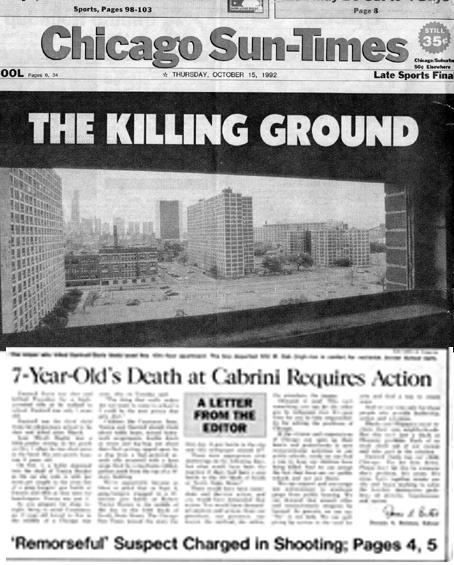 Today's Chicago Tribune devoted the front page and two full inside pages on a story showing the impact of shootings in Chicago. Included was an interactive map at http://chicagotribune.com/shootings that you can click on to understand the number of people shot in Chicago in the first six months of 2013 - 1,043. 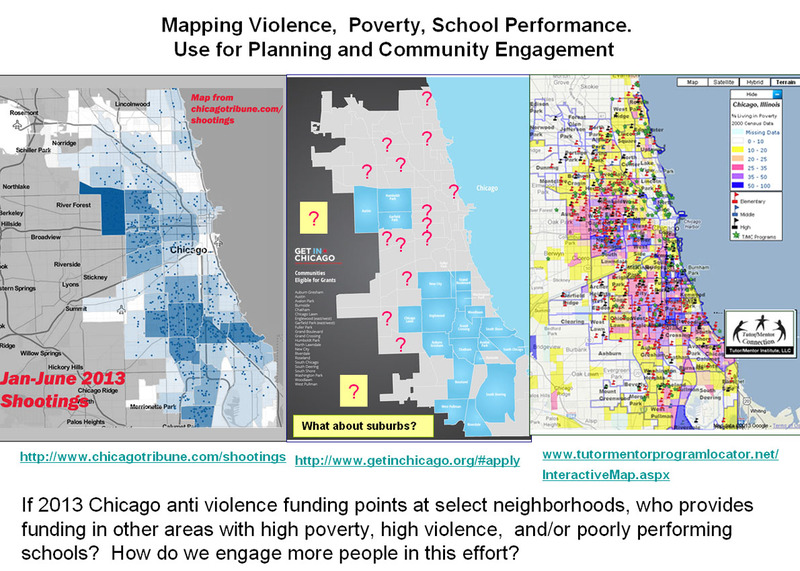 I created a map story in April 2013, showing the areas of Chicago targeted for new corporate philanthropy, along with a map from the Tutor/Mentor Program Locator, showing areas of poverty and poorly performing schools. The goal was to engage people in strategies that provided on-going funds for youth mentoring, tutoring, learning and jobs programs in all of the neighborhoods shown on the map to be areas of need. I updated that map today with the map from the Chicago Tribune site. 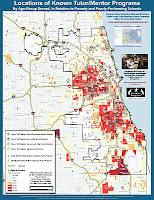 The Program Locator map and the Chicago Tribune map show many neighborhoods where youth and families need extra help. The challenge is to engage people from business, faith groups, civic groups, public health, universities, etc. in an on-going process that leads to a better understanding of the root-causes of the problem along with a better understanding of potential solutions, based on what we can learn from efforts all over the world. Furthermore, this understanding has to lead to a growth in solution providers in all of the neighborhoods shown on the maps to have a need for extra help. This problem is not new. Finding a way to build on-going engagement of hundreds of thousands of people in the Chicago region would be new. One potential is the use of MOOCs, as described in this Harvard Business Review article, as well as in other articles I've written about MOOCs and Learning on this blog. 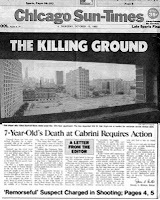 “7-Year-Old’s Death at Cabrini Requires Action.” Sept 2008 article shows front cover of October 1992 Chicago SunTimes. 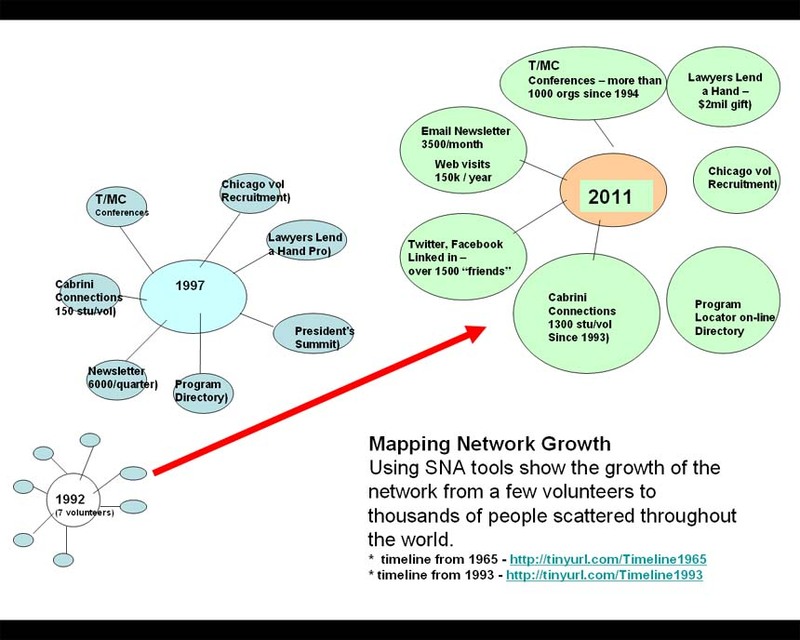 I encourage you to read this article about building networks and mapping their growth. When you read my articles about MOOCs and Learning you'll see that I point to a library of articles that people can use to expand their knowledge. I keep adding new links to the library all the time, such as this Chicago Crime Lab page. In a MOOC we are encouraging people to dig through these links at their own pace and share what they are learning in a variety of on-line communities where they learn from others, while also building relationships with people who might work together to implement some of these ideas in more places where the maps indicate need. Until we can find investors who will help finance the network building that leads to more people reading articles like this and engaging their friends, co-workers, family and others in understanding the information and applying their own time, talent and dollars to supporting solutions in different places ON AN ON_GOING BASIS, we'll still be reading media stories about violence and shooting in Chicago and other cities 20 years from now. 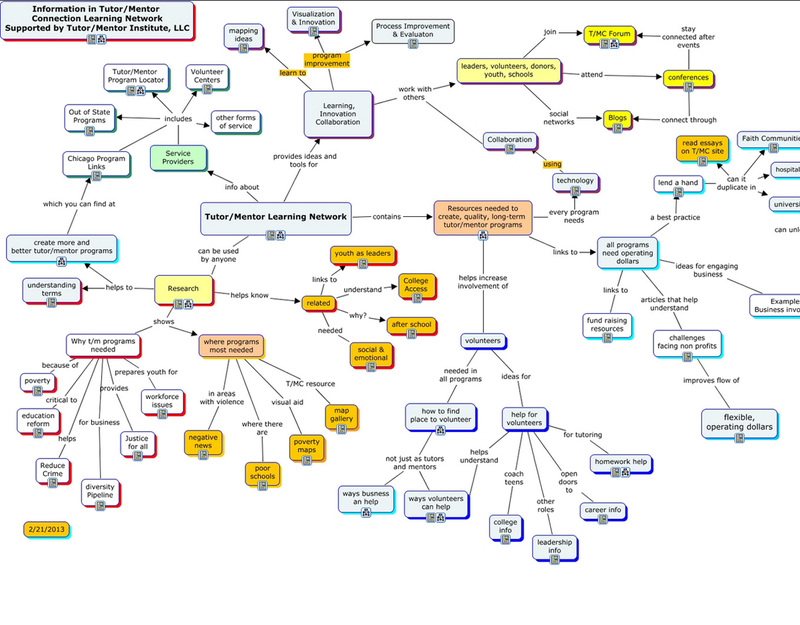 I've been participating in the Making Learning Connected MOOC this week (#CLMOOC)and the topic has been mapping. As a result of a suggestion I made over the past weekend a Google map has been launched that participants can add their name to. See it here. MOOCs are idea sharing events. If you can participate long enough you learn new ideas that might be applied to your own work. For instance, in last night's Google Hangout chat, I shared a post about mapping networks of Facebook and Linked in Friends, and the Mention Map that enables you to see who you're connected to on any given day on Twitter. Someone asked if there was a way to map Twitter friends by geographic location. I said, "I don't know". And then someone else said, "Try Map My Followers." I tried it and the image below is from the map of my followers. To use this, or the Twitter Mention Map, you need to first connect using your own Twitter username. Once you've done that you can create a map of your own followers, or you can enter the username of another person to see the distribution of their followers. My username is "tutormentorteam" so if you enter that in the Map My Followers site you'll get the map shown above. It's interactive so you can zoom in to any section of the world and see how many followers I have from that section and you can click on the icon to see who they are. 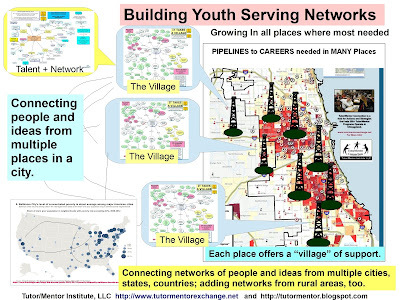 I use maps like this to show other organizations in Chicago who also focus on the well-being of youth and my goal is to connect with these groups in events they host, conferences I host, and on-line space where we can connect with each other on a much more frequent basis. Unfortunately, if you look at my Twitter friends in the Chicago region, you don't see nearly as many followers as you would expect in a city as large as Chicago, nor do you see too many from among the groups shown on the concept map. If you look at the map showing participation in the last Tutor/Mentor Conference, you'll see a few intermediary organizations like Alternative Schools Network, ServeIllinois, Illinois Mentoring Partnership, but still only a small percent of those who I hope to connect during these events. My conference and network maps also show few from business, philanthropy, politics, media, faith groups, meaning THE VILLAGE it takes to raise a child is meeting some place else....or it's not meeting with any great deal of connectivity, AT ALL. There are probably a lot of reasons for this but as we celebrate the 4th of July, and the county built by many people working together for a common purpose, I hope that anyone reading this who's not connected to me on Twitter, Facebook or Linked in will reach out and connect, and that you'll spend time over the next six weeks reaching out to others who are working to improve the futures of youth in poverty, so more people are connected to me, AND EACH OTHER, in on-line communities and in events that connect us face-to-face, while building attention and mobilizing resources for all of the organizations in the Chicago region who engage volunteers in organized tutoring, mentoring, arts, technology and learning programs. In addition to helping me expand my network, I encourage you to challenge others to build network maps like I have shown here, and place them in their own web sites and blogs. If we're all working in silos how can we mobilize all of the people and resources needed to help solve the problems that face families in so many different parts of the Chicago region? 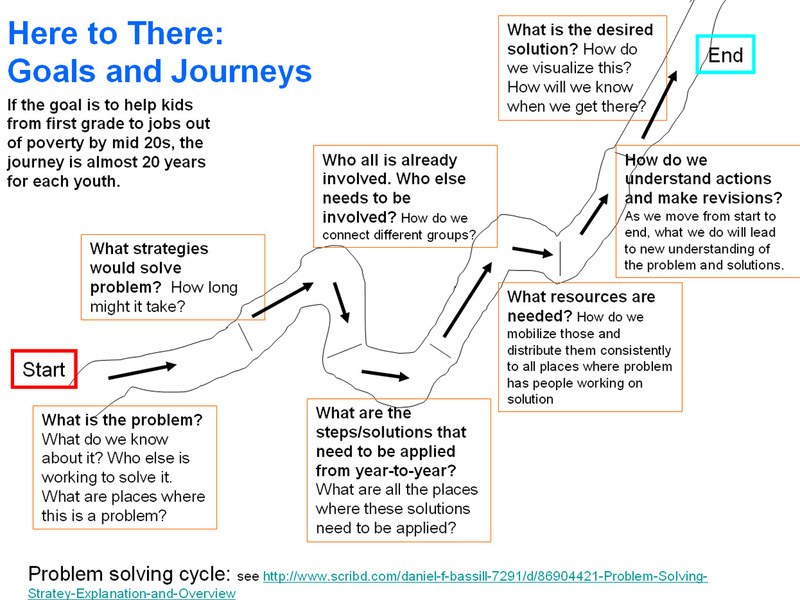 If you're in another city, apply this thinking and mapping to your own efforts. Share them and we can learn from you. We honor athletes. Why don't we honor nerds? Last Saturday I was a guest speaker at a meeting hosted by the India Development Coalition of America. One of the other speakers was Dr. Ratnam Chitturi, Founder of the North South Foundation, in Burr Ridge, Ill. I was not aware of this organization although I've networked with members of IDCA for almost a decade. Dr. Ratman started his presentation with this video, which I think is great! Then he talked about why Indian kids do so well in completions that test knowledge and intelligence. He said "We have a minor league network that starts preparing kids as early as 1st grade!" I browsed around the North South Foundation web site this morning and found another article titled, "Why Are Indian Kids So Good at Spelling?" which was in the Washington Post in 2010. This program seems to include Indian youth, but the concept could be duplicated in the Black, Hispanic, American Indian, and White communities. It seems that volunteer-based tutor/mentor programs might adopt this concept, reaching youth early and engaging them in competitions as they grow older. If we make learning cool, or "honor nerds" maybe more kids will become more motivated and inspired to learn on their own. As Dr. Chitturi said "Once motivated and inspired, the sky is the limit." That's been the goal of tutor/mentor programs I've been part of. If we can help such programs be available to youth in more places where learning is not valued as much as computer games or sports or music videos, we can build systems of support that mirror what North South Foundation has built over the past 24 years. 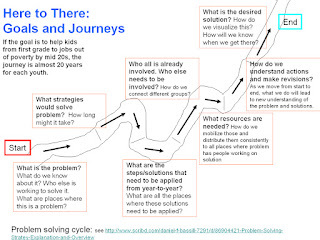 Volunteers and donors who already are part of youth tutoring/mentoring programs could stimulate the growth of these ideas in more places as we enter the 2013-14 school year. Just share this information and form a group to innovate ways to bring the ideas into programs you're involved with.